Books about cults were big last year: Emma Cline’s The Girls, about the Manson family, was the talk of 2016. Locally, Laura Elizabeth Woollett’s The Love of a Bad Man included stories about the Mansons and Jonestown. And Scientology was the subject of an Australian exposé, Fair Game (by Steve Cannane), which complemented Lawrence Wright’s damning international bestseller, Going Clear. The Family will appeal to readers of these books, as well as fans of journalistic true crime, with its immaculately researched and reported story of notorious Melbourne cult The Family and its figurehead Anne Hamilton-Byrne, a yoga teacher who convinced her spiritually curious followers that she was Jesus reincarnated. Based between Ferny Creek (in the heart of the Dandenongs) and Lake Eildon, with firm roots in the University of Melbourne, where co-founder Raynor Johnson headed Queen’s College, the cult’s history is deeply embedded in that of Melbourne itself. Several members were drawn from society’s upper echelons: Johnson was friends with Sir Reginald Ansett (former owner of Channel Ten) and had been close to Ambrose Pratt (a co-founder of the Liberal Party). Prominent psychiatrists, including four of the nineteen in Australia authorised to prescribe LSD, were members, along with many nurses. These connections enabled appalling abuses: the illegal adoption (often resembling kidnapping) of babies who were claimed as Hamilton-Byrne’s biological children and the indoctrination of members using LSD administered at a Kew psychiatric hospital. 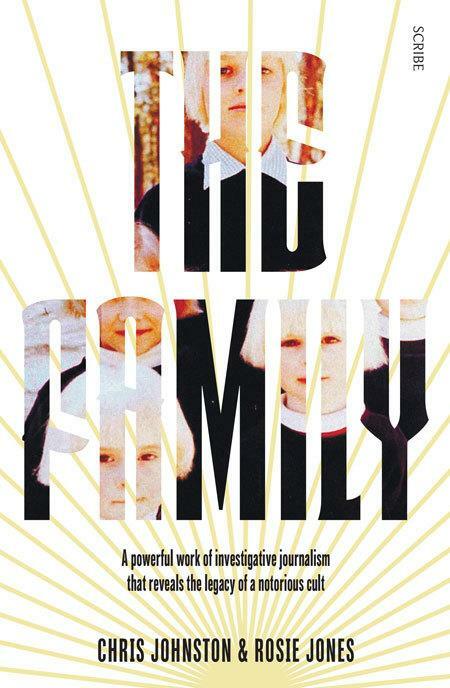 The Family follows the long police investigation that uncovered The Family’s crimes, and the experiences of the 14 adopted children and 14 ‘fosters’ brought up in the cult, at a secluded property far from the adult members, apart for a rotating roster of ‘aunties’ whose care-taking involved regular beating and starvation. This important book looks at how (and asks why) these abuses happened, defying the cult’s motto: ‘unseen, unheard, unknown’.